"Let us brighten your day." Sunshine Lighting Company is a locally owned lighting specialist serving the commercial sector in greater Kansas City, MO. 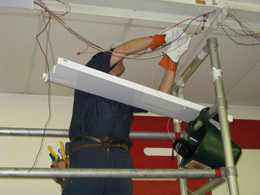 Established in 1977, we have over 40 years of experience in lighting maintenance and management. You can trust Sunshine Lighting to brighten your day! Retrofitting refers to the addition of new technology or features to older systems. In simple terms, we take your existing lighting fixtures and make them more energy efficient by replacing the lamps/bulbs and ballasts making them as energy efficient as possible, while retaining or improving your current lighting level. Conveniently located in Kansas City, Missouri, Sunshine Lighting serves the greater Kansas City metro including towns in both Missouri and Kansas. With 12 fully stocked service vans and completely uniformed, trained service technicians, with a 14 year average length of employment, we are dedicated to bringing our customers the absolute best service and quality lighting. From providing effective lighting to helping optimize lighting efficiency, Sunshine Lighting is available to help your business--commercial, retail, or industrial--with all of your lighting management and maintenance needs. Call today to learn more about our commercial lighting services and outstanding customer service. We'd love to help your company achieve superior lighting! For your safety and peace of mind, Sunshine Lighting is fully insured. To better serve our customers, we are members of NALMCO (International Association of Lighting Management Companies) and PLASMA (Professional Lighting and Sign Management Companies of America). Sunshine Lighting Company does not offer residential lighting or electrical services not related to lighting fixtures. We apologize for any inconvenience. "Sunshine Lighting is a highly valued service vendor who has provided weekly lighting maintenance for the past 20 yrs...Read More"
© Sunshine Lighting Company. All Rights Reserved.